“I found all of the elements of standardized work — work standards, work combination tables, kaizen opportunity lists — clearly posted in work areas, but no standardized work and no standardized front-line management. A few minutes’ observation revealed that the work was not actually being done in the way the work standards required…” –Jim Womack, Gemba Walks, p. 76, “The Mind of the Lean Manager” essay. Establishing and following standardized work is an essential part of any lean transformation, serving as the foundation for kaizen. But in practice, many organizations struggle with issues of leadership, culture, and resistance when implementing or sustaining standardized work. “The major challenge is convincing people to accept standardized work,” says Sammy Obara, a Lean Enterprise Institute faculty member and managing director of honsha.org, a San Diego-based lean consulting group comprised of former Toyota employees. Standardized work consists of a detailed, documented, and visual system that serves as a blueprint for people to follow to perform tasks in a predefined process. Typically centered around human movements, standardized work outlines efficient, safe work methods that help eliminate waste and serve as the baseline for kaizen, or continuous improvement. Standardized work documents the current best practice, and as the standard is improved, the new standard becomes the baseline for further improvements. In practice, some groups tend to be more open, while others are more resistant, to accepting and embracing standardized work. Not surprisingly, Obara has found that military organizations are among the best at following strict standardized work methods. Employees of pharmaceutical firms also tend to more readily accept standardized work, perhaps because they are accustomed to following the requirements of the Food and Drug Administration. The first five steps took up so much of the hour session that when Obara clocked the time one surfer spent actually surfing, it was a total of five seconds standing up on his board on three waves. For example, fitting took 10 minutes. As the dozen students Obara observed scrambled among one another to find the best-looking suits, some got the wrong size, boys got girls’ suits and vice-versa, while others got wetsuits that were still wet from previous use. He suggested organizing the wetsuits in advance, assigning each student his or her own suit on a dedicated hanger so it could be picked up before the start of class. As a result, they were able to add 10 minutes of actual surfing time to the end of the lesson. For the land surfing component, instructors showed each student where to place their feet on the board during each maneuver– i.e., getting up on the board, standing, acquiring balance, and finally picking up speed. Having placed one or both feet only a few inches to the left, right, forward or to the rear of the correct position often resulted in a wipeout once they stood and attempted to balance on the board. Students had to repeat this 10 times, each time going from lying on the board on the sand in a simulation routine, to the standing position on the board. Some students would get their feet in the right places the first time, but most had to be shown where their feet belong. Precise work sequence in which an operator performs tasks within takt time. Standard inventory, including units in machines, required to keep the process operating smoothly. 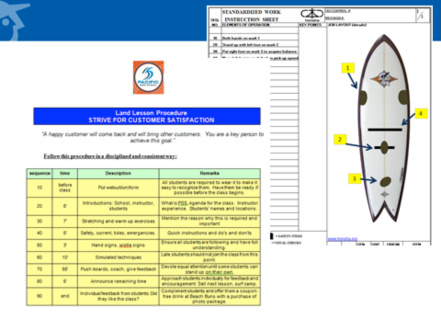 Two standardized work sheets developed at the Pacific Surfing School created a uniform curriculum (left) for instructors and a way for students to self-check foot placement (right) to practice correctly on land. The owner of the surfing school, Emiliano Abate, convinced his people that the organization would fail if they did not implement standardized work, Obara says. “His leadership played a key role in getting people to follow his example and his commitment to standardized work,” Obara adds. In the communications segment, instructors had different approaches to introduce all the students and themselves. In fact, the variability of instruction techniques used by the teachers afforded plenty of opportunities for improvement by applying standardized work. “The key was to look at this type of business from a somewhat similar angle that manufacturing does,” Obara says. “I soon realized that the best perspective was to see students as the raw materials coming in, and an hour later, finished goods going out the door as surfers. The school was the factory and the instructors, the processes. The batch was about 12 students per session — like a dozen in a box. So takt time, one of the three key elements of standardized work, would have to be 60 minutes divided by 12, or five minutes per student. Takt time is calculated as available time divided by customer demand. LEI faculty member Sammy Obara, standing center, teaches standardized work to surfing instructors. In this case, the standard in-process stock turned out to be surf boards and students. Boards chipped or damaged in a class previously were set aside for repairs so they could be used again the next day. Now, instead of retiring the damaged boards for the entire day, instructors fix the boards as they come back, to be put in use at the next session that day. Similarly, when too many students signed up for a class, those who could be flexible with their time became standbys, waiting for the next available class. In exchange for waiting, they got a half hour extra time on the board. “That was a way to eliminate wait, either for the boards or for students,” Obara explains. In this case, standardizing the work of instructors instilled discipline in the surfing school’s culture, an essential element for lean to take root, flourish, and be sustainable. Once standardized work was fully implemented, the students had more time to surf at the end of each class, which freed instructors to do other tasks, such as repairing surfboards that had been damaged during use so they could be reused the next session. In the past, the only time left for this task was at the end of the day after classes were done. The problem was, with the waning daylight, some boards got only partially repaired, or poorly fixed at that. By having a more efficient, standardized work routine,instructors were able to boost the number of students per class from 12 to 18. This increase in capacity was matched by a similar increase in demand due to the expanded marketing efforts of instructors. Overall, Abate reports, the end result has been a revenue gain of about 85%. In other words, overcoming resistance by ensuring that leadership and culture of an organization are fully committed to standardized work pays off in more ways than one. Learn how to use standardized work to advance your continuous improvement efforts by attending the workshopStandardized Work: the Foundation for Kaizen, facilitated by Sammy Obara. Take a moment to review the agenda and watch a short video by Sammy. Hear from Emiliano Abate, owner, Pacific Surfing School, on standardized work. Douglas Bartholomew is a journalist specializing in manufacturing, information technology, and finance. A former Senior Technology Editor and IT Columnist at IndustryWeek magazine and Senior Writer at InformationWeek, he has written extensively for a variety of manufacturing publications and online sites. Most recently, Bartholomew’s cover story on biosimilar manufacturing appeared inPharmaceutical Manufacturing magazine, and he has researched and written numerous articles for the Lean Enterprise Institute site, including case studies of lean transformations at Menlo Worldwide, Fedex Aircraft Maintenance at LAX, Chula Vista city government, Aera Energy, O.C. Tanner, and Autoliv. He also was Editor of the 2012 Machines Italia magazine for the Italian Trade Commission.